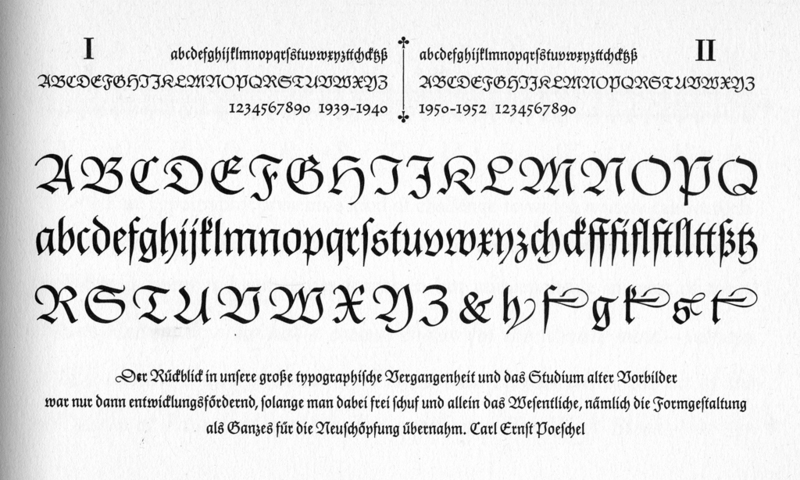 Gilgengart Fraktur (often shortened to just Gilgengart) was the ﬁrst typeface designed by Hermann Zapf. Its history is not only complicated but a bit muddy. This is because in the various books on his career, Zapf has given conflicting accounts of its origins and of the dates of each of its stages. Before trying to untangle the true story of Gilgengart, it should be noted that for all of his typefaces Zapf rightly makes a crucial distinction among the three phases of a typeface’s life: 1. the period when it was designed—when its letters were ﬁrst conceived and sketched out; 2. the period when it was cut, proofed and cast; and 3. the date when it was ﬁnally released to the public. Thus, a typeface can have up to three dates assigned to it. Manuale Typographicum (1954), p. 77 (cropped) showing Gilgengart I and II. Typography by Hermann Zapf. Zapf leaves the rest of the Gilgengart story untold in About Alphabets. However, in the list of typefaces at the back of the book, Gilgengart is joined by Gilgengart II and Gilgengart Initials without any explanation about the relationship among them. Gilgengart is listed as having been designed in 1938–1939 and issued in 1940; Gilgengart II as having been designed in 1940 and issued in 1951; and Gilgengart Initials as having been designed in 1949 but never issued (p. 109). Note the contradiction between the dates for Gilgengart in the list and those in Zapf’s narrative. All of the versions of Gilgengart are shown on pages 86–87 of About Alphabets. The character set for Gilgengart I is at the top of page 86 while that for Gilgengart II is at the bottom. In the middle is an unlabeled version of Gilgengart at a larger size. 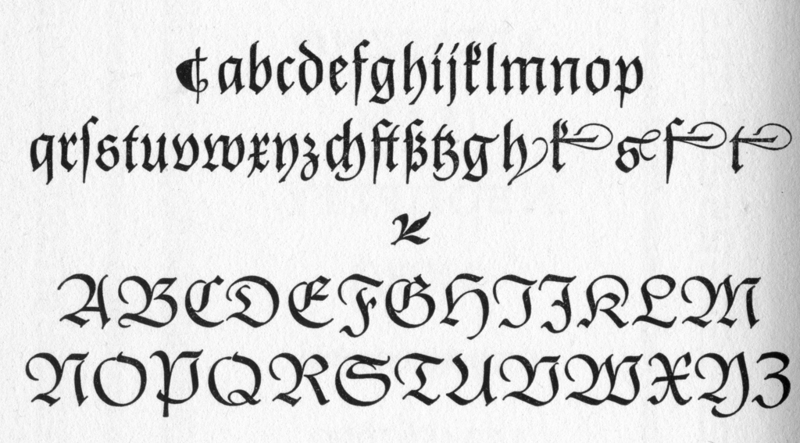 (Other than B, this Gilgengart is identical to the large one shown in the Manual Typographicum.) The page is unhelpfully captioned “Gilgengart (ﬁrst trial and ﬁnal form)”. The implication is that Gilgengart I is the ﬁrst trial and that Gilgengart II is the ﬁnal form—but then where does the large alphabet ﬁt in? Gilgengart Initials are displayed on page 87. Gilgengart II. Detail from About Alphabets, p. 86. Gilgengart (trial or larger size of Gilgengart I). Detail from About Alphabets, p. 86. Already the history of Gilgengart has become very confused. But this confusion, instead of being cleared up in later books by and about Zapf, gets deeper. In Hermann Zapf and His Design Philosophy (1987) Gilgengart I and II are shown in the margins of page 20. 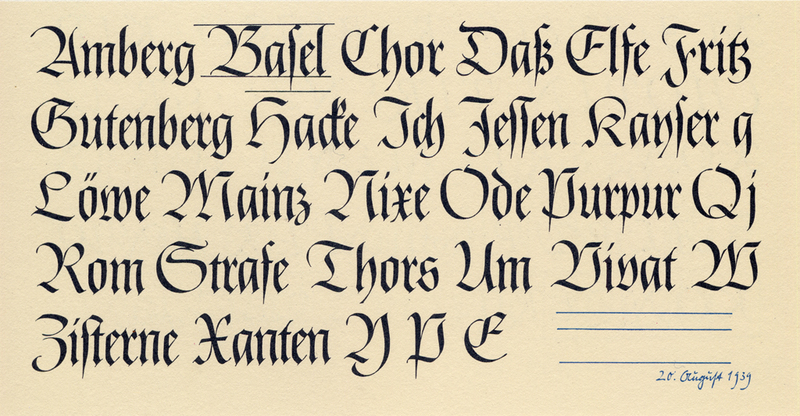 Zapf writes, “In the same year [that he was retained by D. Stempel AG as a type designer] my ﬁrst type design, a Fraktur, was accepted by the foundry, though the coming of war delayed the type’s appearance. The ﬁrst test size, handcut by August Rosenberger, was ready in 1940…. The wholly unreasonable decision by the German government in 1941 against Fraktur types hampered its completion.” He says the design was modiﬁed after World War II but provides no details. Similarly, he does not explicitly say when he was hired by Stempel, but other information in the book indicates it was either in late 1938 or sometime in early 1939. Knowing exactly when Zapf joined the typefoundry is key to arriving at a date for Gilgengart’s design. In the list of Zapf’s typefaces in Hermann Zapf and His Design Philosophy the date of Gilgengart’s design is given as 1938 (p. 125). It also says that the pilot size (36 pt) of the face was cut by August Rosenberger in 1940 and that the 12 pt size for the linotype machine was cut by Walter Baack of Linotype GmbH in 1939–1940. “The type was ﬁrst shown in 1941,” Zapf writes, though it is unclear whether he means that it was released or only displayed in a magazine or other venue. It is unfortunate that the exact month in 1941 is not provided since that would help to locate Gilgengart’s history within the larger history of blackletter types issued during the Nazi era. All of the above information pertains to Gilgengart I. The revised design, Gilgengart II, is listed (p. 126) as having been designed in 1950 and cut in 1952. It was a simpliﬁed version that was intended solely for use on the linotype machine. In ABC–XYZapf: Fifty Years in Alphabet Design (1989), a tribute to Zapf jointly arranged by the Wynkyn de Worde Society in London and the Bund Deutscher Buchkünstler in Germany, Gilgengart (presumably Gilgengart I) is said to have been released in 1941 (p. 251). There is no information on Gilgengart II. In “Über Hermann Zapf,” (pp. 17–26) Max Caflisch (1916–2004), typographer and type historian, gives 1938 as the design date for Gilgengart (p. 20). This is odd since the source he cites is About Alphabets which has the conflicting dates of 1939 and 1938–1939. ABC–XYZapf (p. 227) includes three images of Gilgengart that had not previously been published. 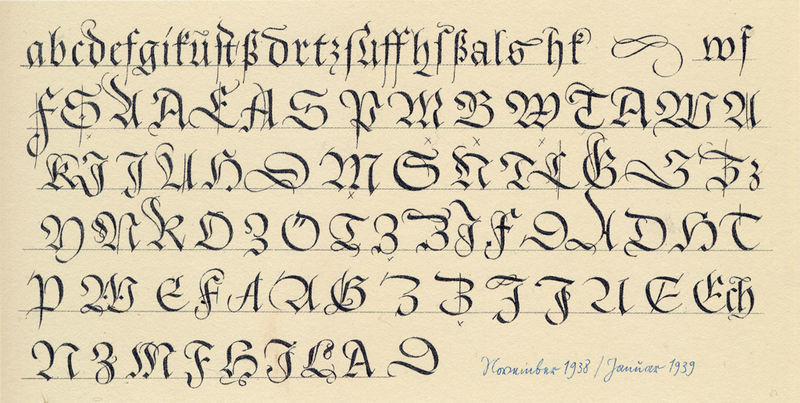 They are described as, “First sketches and trials for the Gilgengart Fraktur done in 1938 and 1939. The type was cut by August Rosenberger in 1940, and released by the D. Stempel AG type foundry in 1941.” (p. 245). The images are dated by Zapf, from top to bottom: November 1938/January 1939, 25 February 1939 and 20 August 1939. (These same images are reproduced in black and white in From the Hand of Hermann Zapf  on page 89 with the same text on page 14.) Close examination of them indicates that all are calligraphic designs and not trials of Gilgengart after its cutting as a typeface. This helps to solve the dating of the design of Gilgengart, but not the dating of its cutting or release—or of its redesign. Gilgengart design dated November 1938–January 1939. From ABC–XYZapf (1989), p. 227 (top). Gilgengart design dated February 1939. 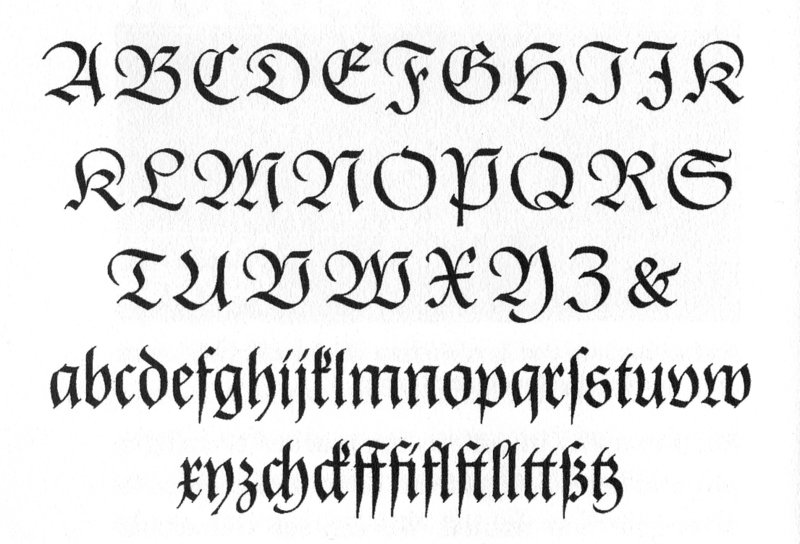 From ABC–XYZapf (1989), p. 227 (middle). Kelly does not clear up the fog surrounding Gilgengart in About More Alphabets (2011), a companion to About Alphabets. Indeed, he adds to it. He writes, “His [Zapf’s] very ﬁrst alphabet design, Gilgengart (1938) was cut and issued for sale, but only after a long and tortuous gestation….” (p. 16). Further on (p. 19) he says that a revised version of Gilgengart was released in 1952, but does not go into any detail about when it was begun or why. “The elegance of the Gilgengart alphabet and the reﬁnement of its drawing are already sophisticated,” Kelly writes, “and of the highest quality, even though Zapf was a mere nineteen years old when the basic design was accepted by the Stempel typefoundry in 1938.” (pp. 16–17). The only illustration of Gilgengart in About More Alphabets (p. 22), captioned “Gilgengart by Hermann Zapf 1938–1948,” shows the same large size alphabet as in the middle of page 86 of About Alphabets but in a different layout and without the alternate g, and swash f, h, k, s, and t. However, the showing also includes the ligatures ff, ﬁ, ﬂ, ll and tt. (The capital K is also repeated.) In many respects, though certainly not all, the letters match those of Gilgengart II. Perhaps this illustration is a cut-up copy of the middle alphabet in the 1954 Manuale Typographicum? Gilgengart. Detail from About More Alphabets (2011), p. 22. So, what is the “truth” about Gilgengart? Hermann Zapf was born 8 November 1918. In 1938, after completing his apprenticeship at the Karl Ulrich & Co. printing plant, he went to work for Paul Koch, son of the calligrapher and type designer Rudolf Koch, who ran a studio for the design of lettering and musical notation. That same year, at the beginning of September, he left Koch to work as a freelance lettering artist (p. 17, About Alphabets). Sometime after that Zapf joined D. Stempel AG, but exactly when is unclear. In About Alphabets (p. 17) he says that Mori “introduced” him to the typefoundry in the autumn of 1938 and in The Fine Art of Letters (p. 11) he says that through Mori he “came into contact with” both Stempel and Linotype GmbH. “I had then just turned twenty, and the Stempel typefoundry was just twice my age,” Zapf writes in About Alphabets (p. 18). This tells us that the design of Gilgengart was begun after November 8, 1938, but it does not ﬁx the date when he went to work for Stempel. The documents reproduced in ABC–XYZapf (p. 227) deﬁnitively date the design of Gilgengart to 1938–1939. The long gap between the November 1938–January 1939 and February 1939 sketches and the August 1939 sketch can be explained by Zapf’s early military service, though even that is a bit hazy. In About Alphabets says that he was called up for Reichsarbeitdienst (labor service) in the summer of 1939, but is no more precise than that (p. 24). In The Fine Art of Hermann Zapf, he is more speciﬁc, saying that he was called into labor service in April 1939—he does not call it Reichsarbeitsdienst—and dismissed in September. This implies that the August 1939 sketch of Gilgengart was done while he was in the service which is certainly plausible given that Zapf worked on his calligraphy while in the German army during World War II. The August 1939 Gilgengart sketch is very polished. At a glance it appears to be type. However, there must have been further adjustments since there are several signiﬁcant differences between its letters and those of the large alphabet identiﬁed as Gilgengart in About Alphabets (p. 86) and About More Alphabets (p. 22): D, E, F, G, I, J, U and Z among the capitals; and k and y among the lowercase. Most tellingly, the August 1939 letters are narrower overall. These changes must have taken place in the fall of 1939 if, as is claimed in Hermann Zapf and His Design Philosophy, Baacke cut a 12 pt pilot size for machine composition in 1939–1940 and Rosenberger cut a 36 pt pilot size for foundry in 1940. What is odd is that the linotype version was apparently cut before the foundry version. If the trial sizes of Gilgengart were cut in late 1939 and 1940, then the release date was probably 1940 and not 1941. This supposition is supported by Zapf’s oblique comment, in About Alphabets, that “the sudden antipathy to fraktur by the government in 1941” was one of the reasons that Gilgengart’s original life was cut short. His comment is a reference to is the so-called “Bormann Circular”, a circular letter, dated 3 January 1941, written on behalf of Martin Bormann, Hitler’s private secretary, in which gothic script (blackletter) was banned on the grounds that it was Jewish in origin. (See p. 48 of the monograph Blackletter: Type and National Identity for a reproduction of this document along with a translation.) Since the circular was prepared “For general notice on behalf of the Führer” and was explicitly labeled “(Not for publication)” it is unclear how quickly its edict when into effect. However, its early January date makes it unlikely that Gilgengart would have been released in 1941. It should be noted that the 1940 edition (volume XXXIII) of Klimschs Jahrbuch—the last one issued—does not include Gilgengart in its Schriftenchronik (list of typefaces). Was this because the type came out in 1941 or because it came out after the date of publication? Gilgengart is also not listed in Das Buch des Setzers (1948, 6th edition) by Fritz Genzmer. In About Alphabets, Zapf says that the working sizes of Gilgengart were “too unquiet” which led to its revision, but he provides no details of that redesign. By “working sizes” he is surely referring to the linotype version of Gilgengart (Gilgengart I). The date of 1940 given in About Alphabets seems unlikely unless the revision began soon after Baacke completed the pilot size. It is more likely that the design was seen as “too unquiet” not at the time of its cutting but during a postwar review. Kelly’s inclusion of 1948 as the concluding date for Gilgengart implies that the design of Gilgengart II occurred that year. Certainly the date of 1950 for its design is contradicted by its appearance in an illustrated edition of Des Kaisers neue Kleider by Hans Christian Andersen published by Stempel in 1949. This information comes from the Chronik der Schriftgiesserei D. Stempel AG (1955) where it also says that Gilgengart was begun in 1938 and released in 1950. Here is an alternative scenario. Perhaps Stempel used the original linotype version of Gilgengart (Gilgengart I before its renaming) in Des Kaisers neue Kleider and it was that setting that convinced Zapf that the typeface was “too unquiet”. In this narrative, the revision of the typeface would then have occurred in 1950 as Zapf indicated in both the 1954 Manuale Typographicum and Hermann Zapf and His Design Philosophy. And then the only remaining area of debate is whether or not Gilgengart II was released in 1951 or 1952. I am leaning towards the latter since that is the date given in the ﬁrst Manuale Typographicum which must have already been in preparation in 1952. As for the Gilgengart Initials, the design date of 1949 seems to be unquestioned. The real question is why they were never released. It could not have been because of any anti-blackletter sentiment on the part of Stempel management in the immediate postwar era since Gilgengart II was given the green light. Gilgengart may not be one of Hermann Zapf’s most famous or most important typefaces. But its tangled history—a combination of aesthetics, technology and politics—is fascinating. It is worthwhile comparing Zapf’s kanzlei alphabet instruction sheet of 1940, created for the magazine Die zeitgemässe Schrift (published by Berlin-based Heintze & Blanckertz Verlag), with the early designs of Gilgengart. It is reproduced in ABC–XYZapf (p. 214). 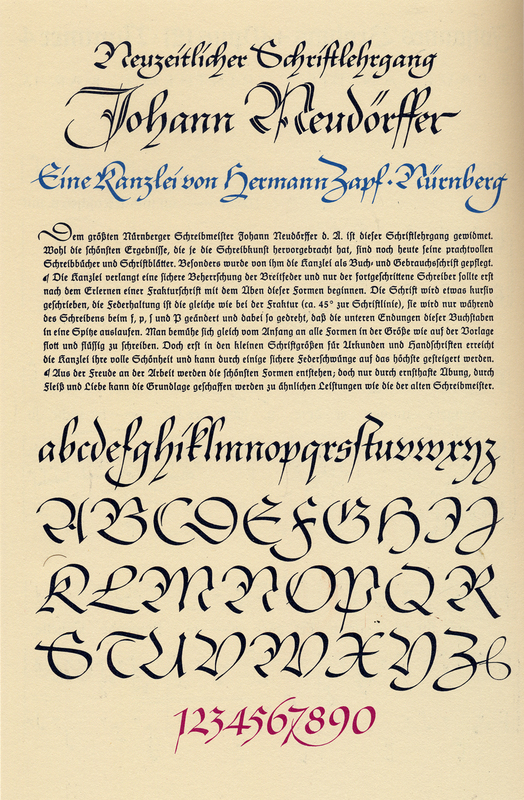 Kanzlei alphabet by Hermann Zapf (1940) for Die zeitgemässe Schrift. From ABC–XYZapf (1989), p. 214. D. Stempel AG. Chronik der Schriftgiesserei D. Stempel AG Frankfurt a.M.: Sechzig Jahre im Dienste der Lettern 1895–1955. (Frankfurt am Main: D. Stempel AG, 1955). Portions available online in English as a PDF. Zapf, Hermann. About Alphabets: Some Marginal Notes on Type Design. (New York: The Typophiles, 1960). Typophiles Chapbook XXXVII. Zapf, Hermann. Hermann Zapf: Ein Arbeitsbericht Herausgegeben von der Lehrdruckererei der Technischen Hochschule Darmstadt. Edited by Walter Wilkes. (Hamburg: Maximilian-Gesellschaft, 1984).